Call 877-242-3136 and purchase this item for $460.00 with our "Advanced Replacement" option. The Continuum PS 120/240 AC 85-U power supply module is designed to provide 24 VDC power for the Continuum NetController CPU module and its associated Continuum I/O modules. 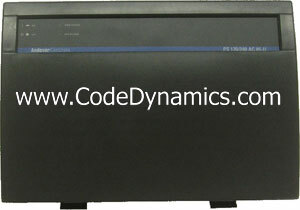 In addition, the PS 120/240 AC 85-U model provides full UPS battery backup in the event of an AC line failure. The PS 120/240 AC 85-U power supply is part of the Andover Controls Continuum Ethernet based intelligent building system. The Continuum system allows you to cost-effectively mix and match DIN rail-mounted CPU, power supply, and various combinations of I/O modules and user interfaces to meet your control and monitoring needs.